If you’re going to grow some spuds this year, you might want to have a look at some of the 30 varieties of seed potato we’ll have available at our Seed Swap and Potato Day. There’s something for everyone, from old favourites to some more unusual varieties. 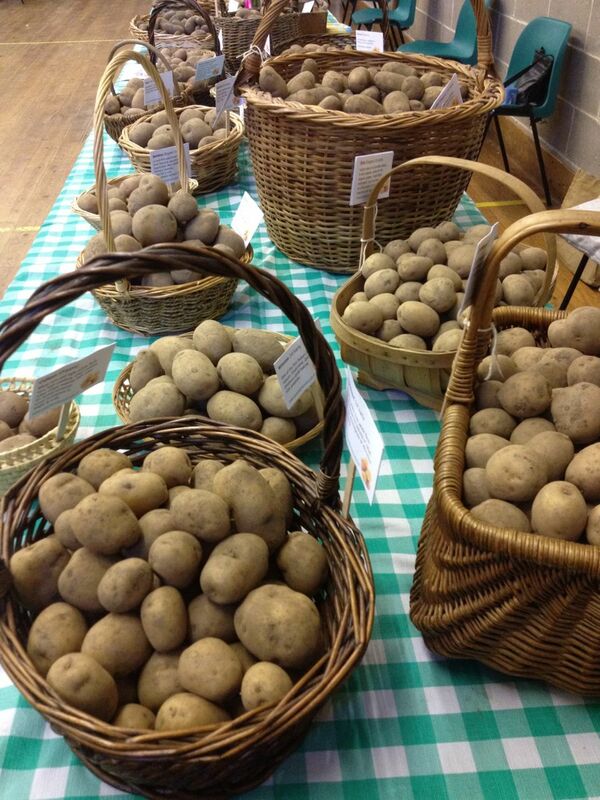 All our potatoes are £2 per dozen, pick and mix (or 20p each). You can choose just what you need – and you’ll be supporting our community activities at the same time. Home Guard is one of the eight heritage varieties that we have available this year. It was the main potato during World War II, being introduced in 1942 and promoted by the Home Guard. It has consistent high and early yields of tasty potatoes. The last time we had Home Guard available, it proved very successful – one participant told us that these were “the best potatoes I’ve ever grown”. So we have jumped at the chance to offer them again this year. Pink Gypsy is one of the new varieties we’re trying this time. It’s quite distinctive looking, with deep pink and cream skins. The tasty white and creamy flesh has a lovely, fluffy texture when cooked. Great whether baked, roasted or mashed. If striking-coloured spuds are your thing, you might also like to try Apache (which has similar markings), Salad Blue, Shetland Black or Highland Burgundy Red. Jazzy is popular with our local growers. This exciting new second early variety has been awarded an RHS Award of Garden Merit for its superb garden performance. It’s a waxy, set-skinnned potato which is both versatile and good looking – boil, steam, crush or roast. Described as a “small potato that packs a big punch” because it’s full of flavour and has performed well in trials. Sarpo potatoes are grown by the Sarvari Research Trust in North Wales. These potatoes all have excellent resistance to blight, so they are ideal for organic growers. Our participants have had great success with them. This year we have Sarpo Kifli and Sarpo Mira on offer. Ideal if you want a reliable main crop. The Sarpo Mira is organic – it’s one of fourteen different organic varieties that we’re offering this year. Pink Fir Apple potatoes are always in high demand here – and rightly so. They’re one of our all time favourites, great tasting both hot and cold. You can cook them whole in their skins, so don’t worry about peeling this unusual shaped spud. To make sure that you don’t miss out on this firm favourite, we keep lots of them in stock. Enjoy! Casablanca (organic), Home Guard, Lady Christl, Maris Bard (organic), Pentland Javelin, Red Duke of York, Rocket, Sharpe’s Express, Swift. Apache, British Queen, Charlotte (organic), Jazzy, Kestrel, Maris Peer (organic), Nicola (organic). Ambo (organic), Cara (organic), Desiree (organic), Foxton (organic), Golden Wonder (organic), Highland Burgundy Red (organic), International Kidney, Pink Gypsy (organic), Pink Fir Apple, Rooster, Salad Blue (organic), Sarpo Kifli, Sarpo Mira (organic), Shetland Black. Local food – Jam, pickles, chutney etc. made from fruit and veg grown in Newsome. Yorkshire Wildlife Trust – Stirley Community Farm will be here to tell you about what’s happening at the farm and how you can get involved. Fresh, farm-grown veg will also be on sale. Want to start composting at home or on your allotment but not sure how? Want some tips about improving your compost? Or want to find out how to set up a wormery? Kirklees Council’s recycling officer, Rachel Palmer, will be on hand at our event to help you learn more about composting. It’s not always possible for us to get all the varieties that we’re asked for, but we do our best to get your favourites (based on what you order in advance and what was popular at our last Potato Day). 1st Earlies: Casablanca (organic), Lady Christl, Maris Bard (organic), Pentland Javelin, Red Duke of York, Rocket, Sharpe’s Express, Swift. 2nd Earlies: British Queen (organic), Charlotte (organic), Jazzy, Kestrel, Maris Peer (organic). Mains: Ambo (organic), Apache, Cara (organic), Desiree (organic), Golden Wonder, International Kidney, Kifli, Nicola (organic), Pink Fir Apple, Pink Gypsy, Rooster, Salad Blue, Sarpo Mira (organic), Shetland Black. Our full 2017 guide will be available nearer the time. but you can buy from our Huddersfield Potato Day on 4th March 2017. Please fill in this form, then select ‘Submit’ to place an advance order. All the seed potatoes will cost no more than 20p each or £2 per dozen. You will be able to collect your order from our Potato Day on Saturday 4th March 2017. Please note: Our maximum advance order for most varieties is 60 tubers (more for Charlotte and Pink Fir Apple). If you’re placing a big order, we’ll get in touch to discuss what’s possible. They’re for sale at £2 for a dozen, mix and match (or 20p each), available for collection from Newsome or from Huddersfield town centre. We may also be able to deliver locally. Good for garden growing – suits a sheltered site with fertile soil. New potato flavour. Heritage variety and winner of an RHS Award of Garden Merit. High yields of general purpose potatoes. 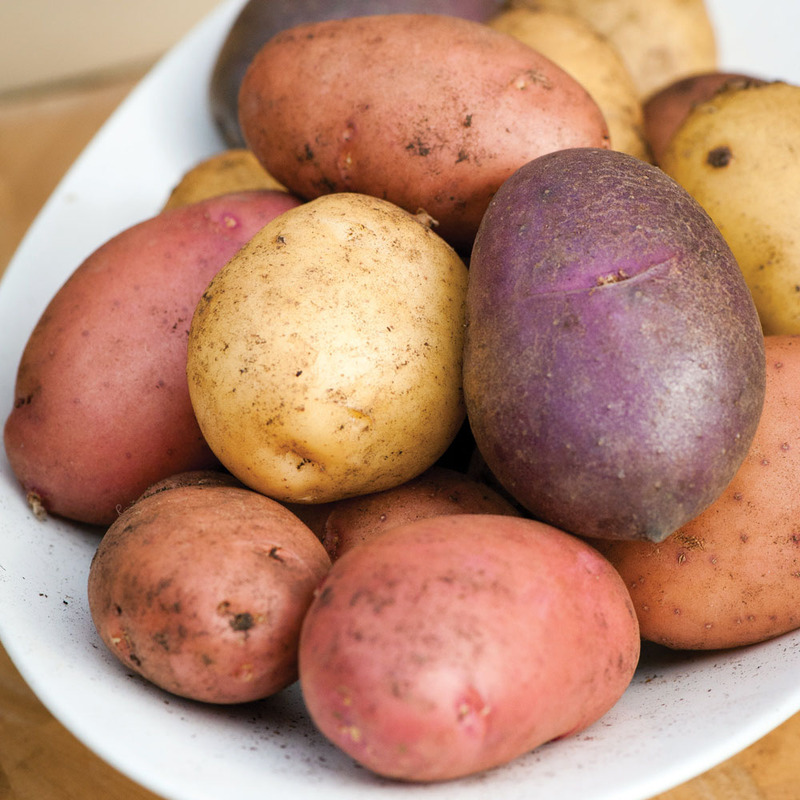 A new waxy potato variety that has proved really popular with local growers. One of the excellent blight-resistant varieties from the Sarvari Trust. Can be grown over a long period. Striking-looking red tubers with white patches. An Albert Bartlett variety with a buttery, nutty flavour. This popular salad variety is a good all rounder. Easy to grow, tastes great and stores well. Organic variety. Pink, fine grained and floury potatoes. Good cropper. We also have some onion sets – free with any potato order of £6 or more. All our potatoes are 20p each (or £2 per dozen). You can pick and mix to get just what you need – and you’ll be supporting our community activities at the same time. Pink Fir Apple potatoes are always in high demand here – and rightly so. They’re one of our all time favourites, great tasting both hot and cold. You can cook them whole in their skins, so don’t worry about peeling this unusual shaped spud. Pink Fir Apple is one of the five heritage varieties that we have available this year. To make sure that you don’t miss out on this firm favourite, we have lots of them in stock. Enjoy! Apache is perhaps the most distinctive looking of our varieties, with red skin dotted with cream patches. It has a buttery chestnut flavour and a waxy texture. You can scrub the skins and cook them whole. The colours stay bright if you blanch them before roasting whole in their skins. If striking-coloured spuds are your thing, you might also like to try Salad Blue, Shetland Black or Kerr’s Pink. Charlotte is the most requested variety amongst our local growers. As well as some of the more unusual varieties, we’ve also chosen some of these more familiar types. These are popular, easy to grow varieties that are reliable croppers. Charlotte is a waxy salad type potato with good flavour and also good resistance to disease. If you’re looking for a reliable salad spud, this could be for you. It’s also one of our thirteen organic varieties. Sarpo potatoes are grown by the Sarvari Research Trust in North Wales. These potatoes all have excellent resistance to blight, so they are ideal for organic growers. Our participants have had great success with them. This year we have four varieties from the Sarvari Trust available – Sarpo Axona, Sarpo Mira, Kifli and Blue Danube (with blue skins but white flesh). Try one or try them all. Choose from 30 different types of seed potato, including popular easy-to-grow varieties and some more unusual types. All seed potatoes are 20p each or £2 per dozen (pick and mix). Casablanca (organic), Lady Christl, Maris Bard (organic), Pentland Javelin, Red Duke of York, Rocket, Sharpe’s Express, Swift. Ambo (organic), Apache, Cara (organic), Desiree (organic), International Kidney, Kerr’s Pink, Kifli, Linda (organic), Nicola (organic), Pink Fir Apple, Rooster, Salad Blue, Sarpo Axona, Sarpo Mira (organic), Sarpo Blue Danube, Setanta (organic), Shetland Black. Potato Guide – Find out more about those weird and wonderful potato varieties by picking up a copy of Alan Romans’ Guide to Seed Potato Varieties. Protect your plants – Low-cost, good quality plant protection materials on sale. Our Seed Swap is partly funded by a grant from the One Community Foundation to help us support people with growing their own food and getting to know others in the local area. Check out their web site for details of community grant funds that you can apply for.